According to the International Business Times, the debate over Confederate symbols on American college campuses that reached the University of Nevada Las Vegas has been thwarted as UNLV's administration fights back. 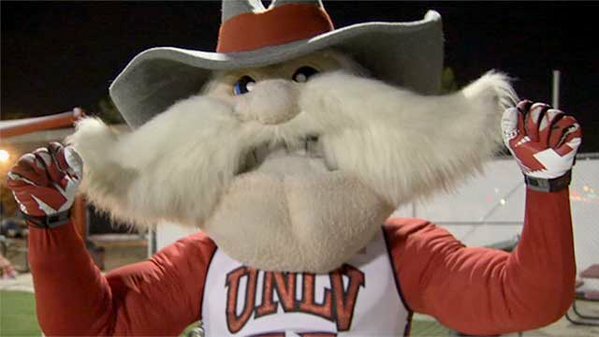 University President Len Jessup released a statement Monday backing the institution's nickname, the Rebels, and mascot, "Hey Reb!" He denied allegations that the character had any connection to the Confederacy. A university report compiled recently by Rainier Spencer, its chief diversity officer, clearly shows that when UNLV was founded, they were seen as 'rebels' for starting a new university in Las Vegas and thus, the nickname. The idea of rebellion stemmed from a desire to be nonconformist and separate from the University of Nevada, Reno. While earlier versions of the mascot embraced the confederacy, that had long been eliminated over 40 years ago. The latest nickname and mascot attack emerged this past summer when violence at a southern church spurred states to began to remove symbols of the confederacy. "It was coined as our young institution was fighting to establish its own identity, and it has come to represent the very independence and spirit that embodies both UNLV and Southern Nevada," Jessup, who took office in January, said. "Rather than trying to erase our history, we must accept it, learn from it, and as we move on, strengthen our resolve for equity and inclusion." The first-year UNLV president held his ground and did not bend to the unfounded criticism. The key here is the logical argument that there was no intended connection between Rebels, Hey Reb, and the confederacy just like there is no intended connection between Pioneers, Denver Boone, and Native American genocide. Its amusing to watch these PC wars flaring all over the country knowing that we've been fighting this crap for the past seven years. When the universities wake up & figure out that donations are being impacted, the administrations may finally stand up to these children. If DU were smart, they would survey all those who publicly said they were withholding donations regarding Boone since 2008 and find out how much actual money they "left on the table" in the past seven years as a result of the decision not to bring Boone back, as well as the future donations that DU continues to lose as a result of this stance. They should also survey the general DU community to find out out what the community might give to the school to DU if Boone were to be restored to official status, as well as any new donations that they got since 2007 or will get as a result of keeping Boone out of official status. Then add in the cost of the failed 2013 mascot search and the reputitional cost/brand dilution of the poor PR DU received as a result back in 2013. The resulting cost/benefit analysis would add a very interesting dimension to DU's strategic planning process. I think of the Running Rebels, the late Jerry Tarkanian's basketball teams. Never once did I associate the UNLV Rebel with the Confedracy. The PC gang needs to get a life! The tide is turning against these Faux protests on campuses around the country.